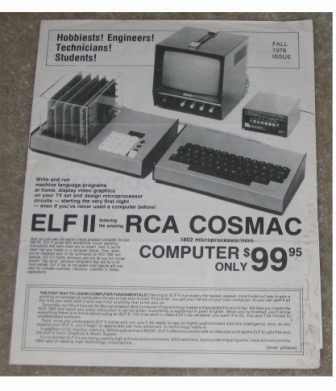 My first computer project Cosmac ELF! The following are photos and information on my first computer project which was started in 1977 while I was still in High School. The project was a small experimenter computer based on the RCA1802 processor built from plans in the 1976 edition of Popular Electronics on the Cosmac ELF micro computer. I made a few minor changes to the project as far as addition of expansion connector and battery jack on back which allowed me to run the computer from a 9v battery. The computer as built has 256 bytes of memory! As you can see it was programmed via machine language using the 8 toggles switches (some were removed for another project). The large red button was the Enter button to enter the toggle switch data. The output was via the 8 LED's on the experimenter board, so you had to be good at your binary to digital conversions to use the computer! The project took several months of stripping and wire wrapping by hand! It worked well and taught me a lot about computers and troubleshooting. At the time I was a serious Lost in Space fan and my original creativity for the project was the character Will Robinson and his tester unit, which was suppose to be like a hand held computer. Below are a couple of views of the computer as it is now, eventually I plan on rebuilding the computer back to working condition. Below are reprint articles from 1976 that I used to build the computer. I only had one of the three issues and had to order the photo copy of the other two issues to finish the project. Also note the expansion articles on improvements that could be made as far as expanded memory and a video display! 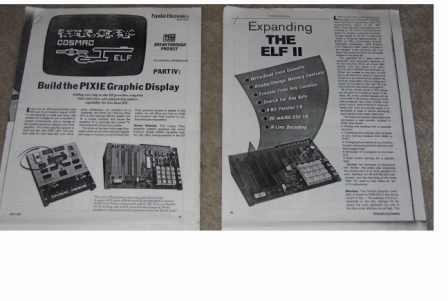 Finally at the bottom is the original advertisement for purchase of a complete ELF II computer from Netronics Research & Development who had a commercial version available for only $99.95!